Funeral Services for Mr. Johnie C. Sanderson, 87, of Tishomingo will be held on Thursday, June 30th, 2011 at 2:00 p. m. in the First Baptist Church of Ravia, Oklahoma with Rev. Roger Hartwell officiating, assisted by Rev. Claude Sutton. Interment will follow in the Condon Grove Cemetery in Milburn, Oklahoma. Military honors will be provided by American Legion Post #164 in Tishomingo. Mr. Sanderson passed away on June 26th, at the Mercy Memorial Health Center in Ardmore, Oklahoma. Johnie was born on January 20th, 1924 in Lewisville, Texas to Andrew Benjamin Sanderson and Lottie Drucilla Sanderson. 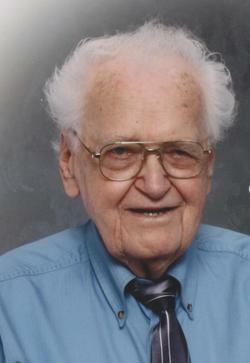 He attended school in Medicine Mound, Texas and later served in the United States Army during WWII. He married Mary Ellen Wood on June 18th, 1949 in Kings High, Texas. Mr. Sanderson worked as a truck driver for the United States Postal Service and was a farmer for many years. They moved to Tishomingo in 2006 from Durant, Oklahoma and had attended the Ravia Baptist Church. He was preceded in death by his parents; three brothers and two sisters. Mr. Sanderson is survived by his wife Mary Ellen Sanderson, of the home; his daughter, Vickey Sanderson of Tishomingo; Nieces and Nephews, Maxie Sanderson, William B. Green, Danny J. Dunson, Richard K. Dunson, Jerry D. Dunson, Roy L. Sanderson,Jr., Linda J. Green, Faye Sanderson, Robert L. Wood, Daniel Knight, Douglas Knight and Debbie Sutton; numerous great-nieces and nephews and other relatives. Pallbearers for the service will be Mr. Sanderson’s nephews. The family will receive friends on Wednesday evening from 7-8 pm, at the funeral home.